Around our neighbourhood in London, ON, seeing skunks is quite common, especially in late July and August. On one particular night, my wife and and I had tickets to see Styx at Rock the Park, a local downtown park weekend concert. Unfortunately, all day the the weather was stormy with torrential rain and lightning. The lineup for RTP was great, but we skipped most due to the nasty weather. As the time for Styx came closer, we decided the weather was not going to improve, and opted out of going. So home, warm and dry, we let the dog out for a quick pee. Being long time pet owners, we are well aware of that moment when you let your dog out, hear the barks, and then smell that distinctive scent that can mean only one thing. The dog has been sprayed…again. What made this particular night at the end of July different was when the dog starting barking, the skunk moved and came face to face with our cat hiding nearby in the bushes. The almost imperceptible pop sound that comes before that dreadful smell happened one second before the cat bolted faster than I have ever seen her move. 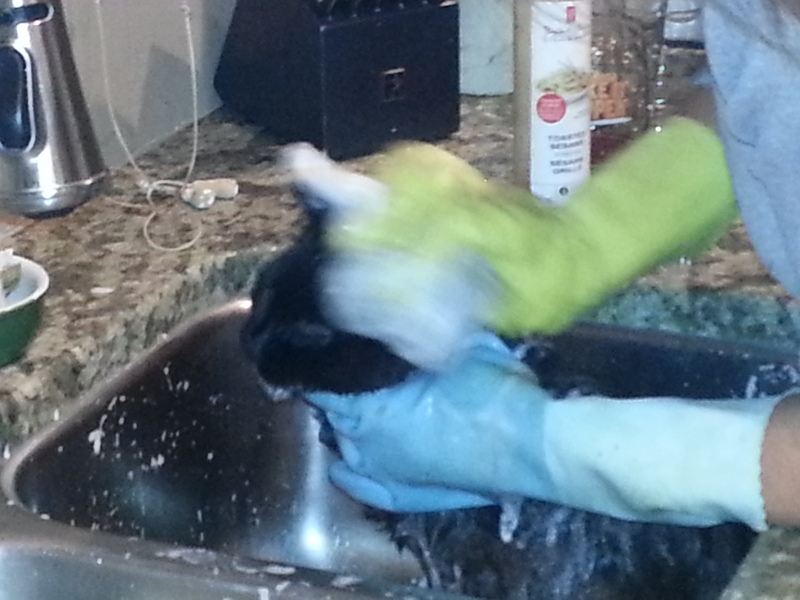 Our cat, Shadow, had taken the skunk spray point blank in the face. For once, our dog, Chase, listened to us and came in, unscathed, when we called him and the skunk disappeared into the night. It took a while to locate our poor cat. She was in distress and hiding in the bushes at the front of house. She wanted desperately in the house, but was not interested in being escorted in due to her unfortunate state. It took her a couple of quick feints to try and get past us, before she realized that we were not going to let her skunky self in the house on her own. While my wife tried to coax the cat close, I went to grab the usual supplies: hydrogen peroxide; baking soda; and, dish soap. For those that have never had to deal with skunk smell, tomato juice is an old wives tale and doesn’t work. A sad cat reluctantly submitting to a bath to get rid of the skunk smell. Eventually, the cat relented and my wife carried her, at arms length, to the kitchen sink. Now normally, our cat is fundamentally opposed to baths, on principle. It is a measure of how much distress she was in, that she didn’t transform into a dynamo of claws and teeth. She was in a miserable state. Both of her eyes were nearly closed and she was foaming from the mouth and nose. She was surprisingly resigned when my wife started applying the skunk removal liquid. We got her well soaked except around her eyes and nose. Once we had her towelled off, we let her go and she shot off to the basement. She still had some of the spray around her eyes, but we needed a moment to figure out how to deal with her eyes and nose. We were very afraid that she was blinded. Since it was now late on a Saturday night, we asked our resident expert, Google. It turns out that several sites recommended milk, of all things. So with cat treats and a bowl of milk we headed down to the basement. Despite her ordeal, she came when we called, took her treat and would let us wash her face with milk for minutes at a time before bolting away again. We repeated the process several times before she started showing improvements. The milk seemed to be providing relief. By the next morning, her eyes and face were less swollen, if still a little stinky, but she was back to her old self. Our first encounter of 2013 was now in the past. The irony of our adventure was that the storm clouds ended up clearing just before Styx began their performance. Styx put on a fantastic show, we heard (sigh), that ended with a fireworks display. If we had gone, would the skunk have still been in our backyard when we let the animals out for their final pee? PS: here is the best skunk smell removal recipe: Mix 1 bottle of 3% Hydrogen Peroxide, 1/4 cup of baking soda and 1 to 2 teaspoons liquid soap in a container and apply to the affected spots of the sprayed animal. Avoid eyes and nose.